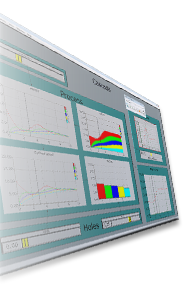 The MyM software has long been used for development and presentations of complex models and decision support systems to be distributed via multiple channels. The following customer spotlights show how companies and government agencies around the world have built the leading-edge MyM model publishing software. The policy decision-support-tool FAIR aims to assess the environmental and abatement costs implications of climate regimes for differentiation of future commitments. The model links long-term climate targets and global reduction objectives with regional emissions allowances and abatement costs, accounting for the used Kyoto Mechanisms. IMAGE is an ecological-environmental framework that simulates the environmental consequences of human activities worldwide. IMAGE has been published on CD-ROM and contains the IMAGE 2.2 elaboration of the SRES storylines. PHOENIX plus provides a population user support system to explore, develop and analyze different demographic scenarios at various geographical aggregation levels (global, regional, national and grid-cells).